The Unified Security Service is a global cloud platform that delivers a range of Internet security products from a single dashboard. The Web Security and Cloud Application Security products operate from 9+ data centres worldwide for complete roaming coverage, best performance and failover. 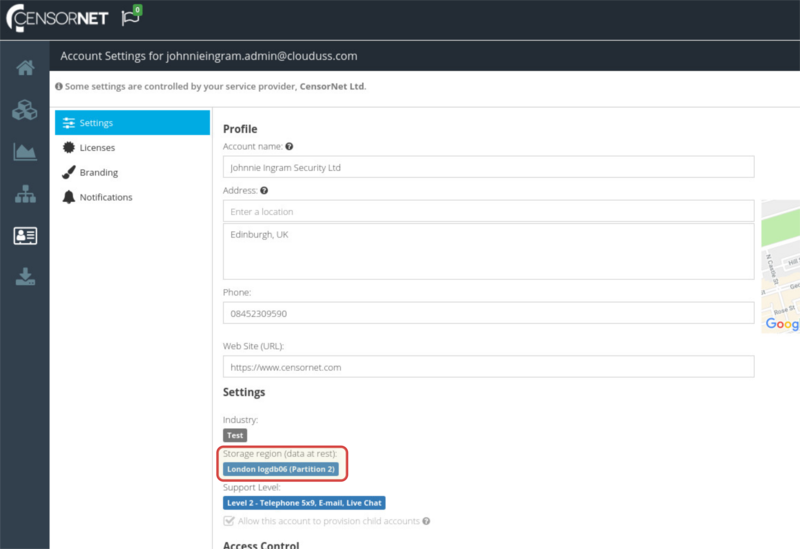 If you have a mobile workforce, the Web Security agent software will automatically connect to the fastest node available wherever your users happen to be in the world. If you use the Web Security or Cloud Application Security products and you are based in the European Union, your account will be locked to the data centers in the UK & Europe region. This is because in order to provide the global Web Security service, certain personal data (specifically the end-user username, MAC address, IP address, email address and certain data sent to cloud applications if you also use Cloud Application Security) needs to be stored temporarily on servers outside of the EU. This temporary data is stored on an encrypted file system or partition and will ultimately be transferred to the data-at-rest region that you have configured for your account. To verify the region your account is currently using, visit your USS Dashboard and click Account Settings ⟶ Licenses. If Web Security or Cloud Application Security are licensed on your account, the Region column will confirm the regions that are in use. Refer to the table below for a list of countries included in each region. In addition to this product-specific region, all of the log data collected by licensed products for your account will be stored in the data-at-rest region for your account, which was chosen at the time your account was provisioned. To verify the region currently in use, visit your USS Dashboard and click Account Settings ⟶ Settings. If you are currently locked to a region and would like to opt-in to the global coverage or change to a different region, please email support@censornet.com requesting to opt-in and provide consent to make the change.